Single Vehicle Roll Over on Old Woodville Road, LIVINGSTON, June 15, 2008 - A single vehicle roll over accident on Old Woodville road at Waka Street sent an 18 year old to Livingston Memorial Hospital. 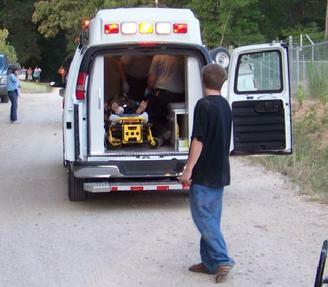 The accident occurred at approximately 7:19 pm on June 15, 2008, when a white 1996 Ford Club Wagon full sized van was east-bound on Old Woodville Road and driven by Patric Cannon, 21, of College Station. According to Cannon, he swerved to avoid a small animal and lost control on the unpaved road and the van rolled. The passenger with Cannon was Brandy Rios, 18, who recently moved from Livingston to College Station. Rios was transported to Livingston Memorial Hospital by Americare Ambulance Service with non-life-threatening injuries. DPS Trooper Robert Akers was dispatched to the scene of the accident. Also at the scene were Polk County Sheriff's Deputies Lee Rogers and David Ramsey. The road was blocked while the accident was being cleared. Both the Cannon and Rios had their seat belts fastened. A wrecker from Polock's Wrecker Service towed the van from the scene. Cannon was issued a citation for no insurance. The accident was cleared out shortly after 8 pm.